Every iOS app should leverage push notifications to boost user engagement and retention. Push notifications are a powerful tool, but implementing them in Swift 5 has been historically tricky since you usually needed a server. 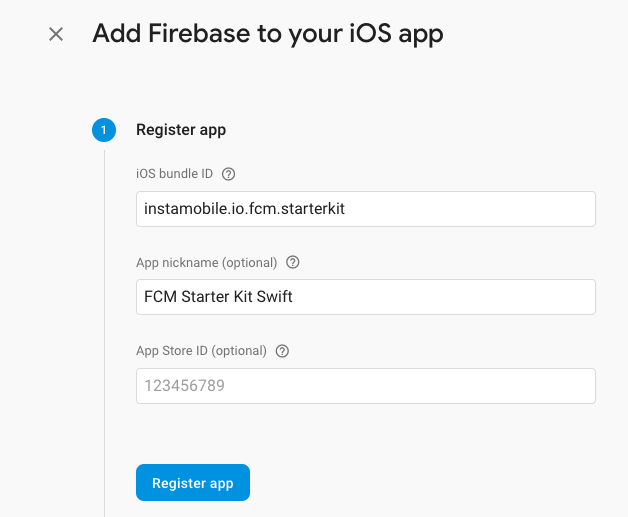 If you’re just getting started with your app development, chances are you’re already using Firebase as your backend. That’s great news – implementing push notifications with Firebase in Swift 5 is what we cover in this tutorial. In fact, we’ve followed exactly these steps to add push notifications to our Group Chat app. The other day, I was working on a dating app template, where I also needed device-to-device push notifications (for a chat feature). As part of that, I wasted several hours debugging multiple issues, while integrating push notifications with Firebase in Swift 5. So I decided to write down all the learnings as well as open-source the implementation so that I’ll save everyone landing on this page a lot of trouble. Feel free to jump to the end or download the free Swift starter kit directly, if you feel confident with your set up already. Let’s get started. Head over to Apple, click “Account” and log into your developer account. 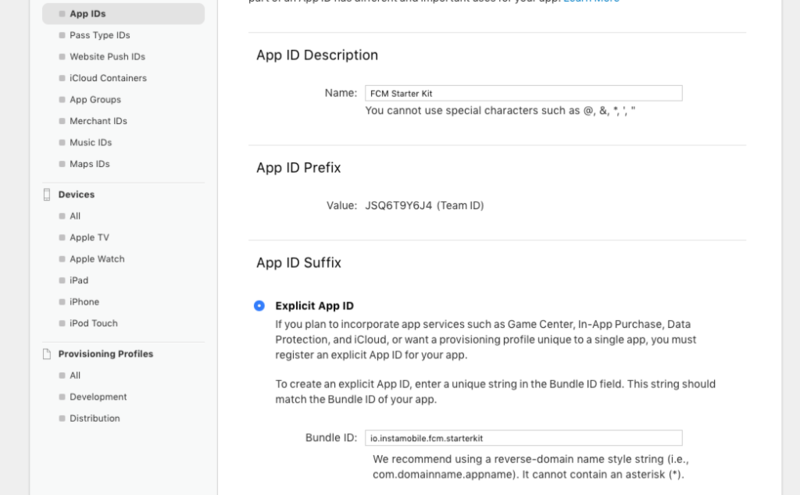 In the new “App IDs” list, select the newly created App ID and click “Edit“. In the next screen on Apple’s website, upload the certificate you’ve just saved to disk. 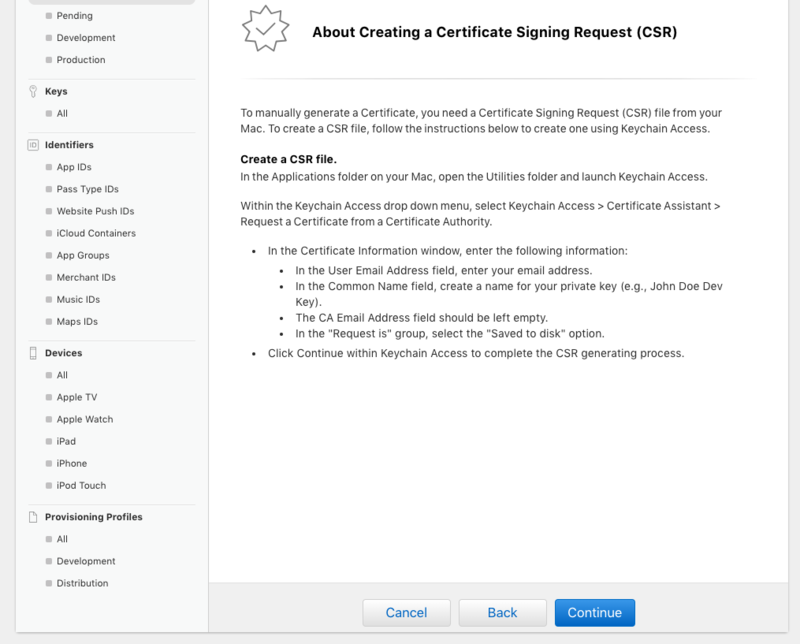 If you’re getting an “Invalid Certificate” error try removing all the expired certificates in your Keychain and re-create the CSR from the previous step. 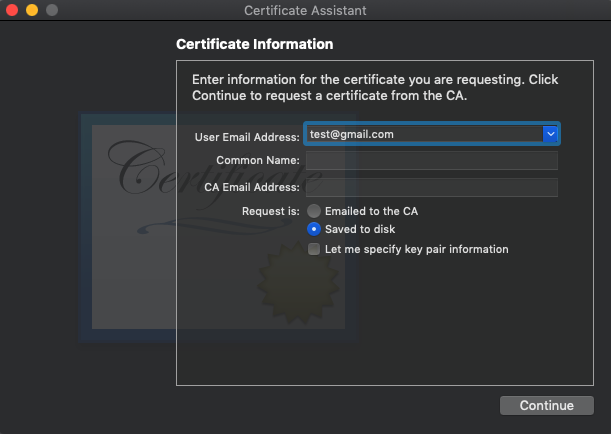 Now you should have a certificate created – download and store it securely on your laptop (the file extension is .cer). Head over to Firebase Console. If you don’t have a project, create one. Then choose a project and head over to its console. If you don’t have an iOS app already, create one by clicking “Add App”. on Firebase Console homepage. Make sure you use exactly the same bundle ID as the one you used in Apple Developer portal. Then download the GoogleService.plist file, which you’ll need to add to your Xcode project. Locate the “APNs Certificates” section and upload the .p12 file you’ve generated previously. If you used a password, you also need to type it in the password field. Now you’ll be able to send push notifications with Firebase in Swift 5. In your projects root directory, run “pod init” or create a Podfile manually. This is the file you’ve downloaded earlier from Firebase Console. In order to connect the iOS app to the Firebase server, you’ll have to add this to the Xcode project. Otherwise, you’ll get a crash. For that, we are providing a helper class to encapsulate the whole logic. PushNotificationManager will handle the registration of the push token for the current device. 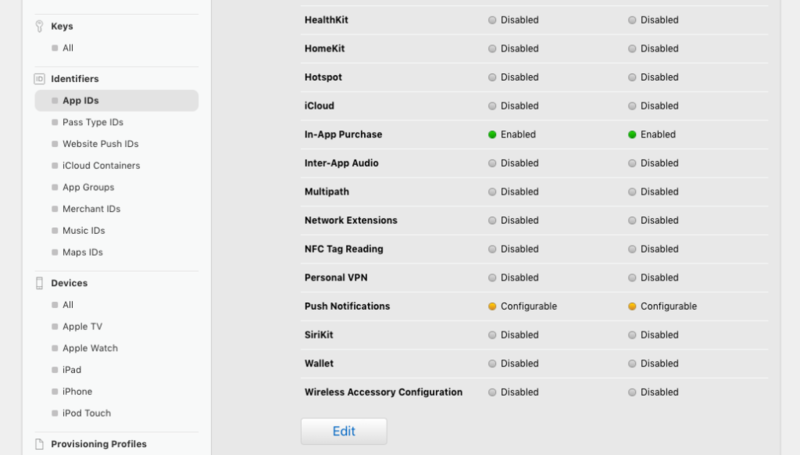 It’ll also trigger a system dialog asking users to accept push notification permissions. Make sure you say “Yes” to that, otherwise notifications won’t send. The object takes in a userID string and maps that userID with the generated push token into users_table in Firestore – this is needed for device-to-device remote push notifications. Now run your app and you should see the system dialog popping up. Accept it and move on to the next step. You should receive the push notification on your device. Please note that this doesn’t work on simulators. You’ll need a real iOS device. And that’s it – you’ve just sent the first notification with Firebase in Swift 5. Take a moment to celebrate. 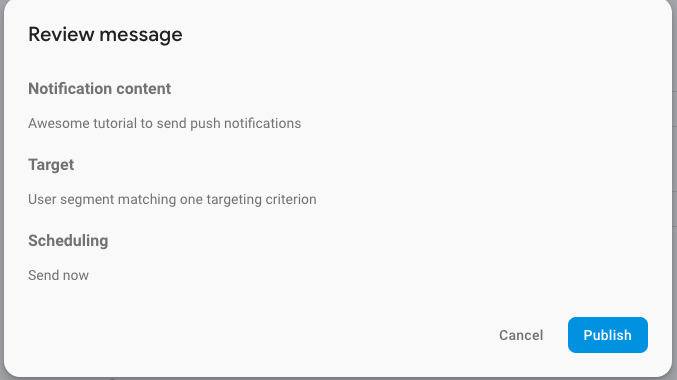 As we mentioned at the beginning of this tutorial, we are going to show our readers how they can send device-to-device push notifications, through Firebase Cloud Messaging. This comes in handy for chatting apps, dating apps, multiplayer iOS games, etc. Easy, right? This is assuming you know the push notification token. But that’s easy to retrieve for any user because you’ve stored the push tokens in the users_table in Firestore, each time a user accepts the push permissions dialog. You can download our open-source Firebase Push Notifications Starter Kit to bypass all these steps. Regardless, you still need to configure your own Apple certificates as well as Firebase projects to be able to send your own notifications. Before submitting to the App Store, make sure you generate a production certificate and upload the .p12 file to Firebase. Was this tutorial useful to you? Please let us know in the comments, star our Github repo, and consider sharing the article to other people who might need it.